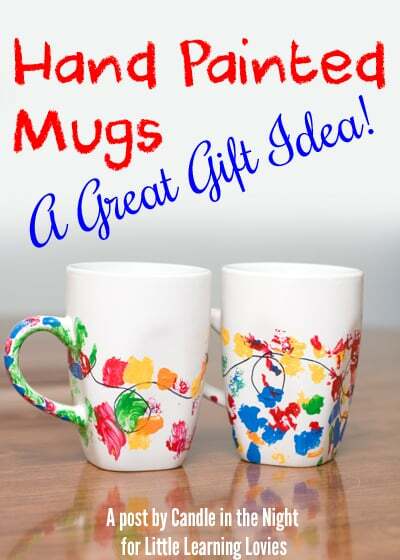 » Hand Painted Mugs: A Great Gift Idea! If your kids are anything like mine, they love making presents for people. My oldest daughter, especially, will make things for people almost daily. A card, a picture, a bracelet from a string of yarn, some pieces of paper taped together… It doesn’t matter if it’s perfect or useful, she just loves making and giving gifts. As a mom, I love this trait, but often, it breaks my heart to think how she would feel if she knew what was happening to all those little gifts. I know people can’t keep every single tiny scrap of paper, but it still breaks my heart. So lately, I’ve tried to find more useful gifts for her to make and give. Today, I want to share with you the latest gift idea. 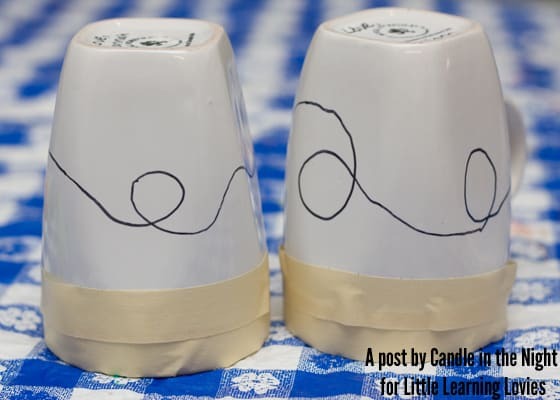 Your child will enjoy making these gifts and they’re sure to be kept for years to come! Step 1: Tape off the top of the mugs. You don’t want the paints to be where people’s mouths are going to be. We’re going to seal them in the oven, but it’s still not food-safe paint. 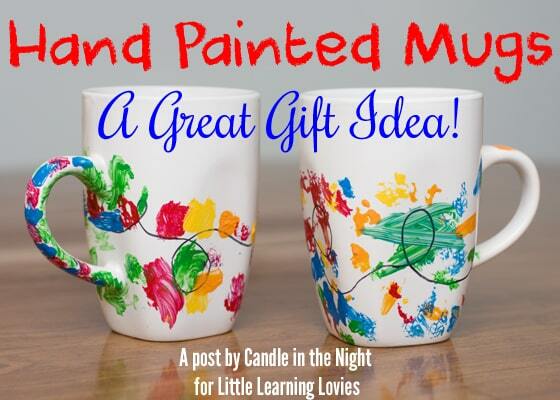 Step 2: We were making Christmas light mugs inspired by this Christmas light finger paint craft. If you want to replicate this, use the sharpie to draw swirly lines around your mug. Also, use the sharpie to write your child’s name on the bottom of the mug. 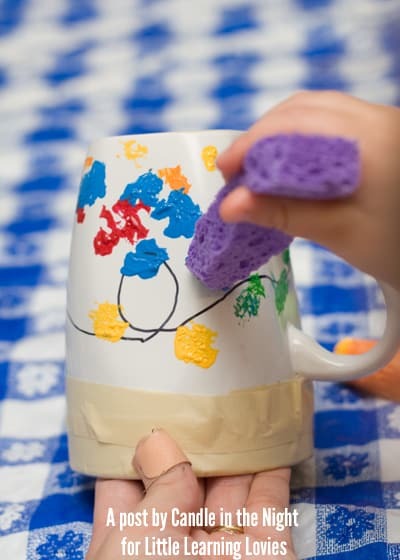 Step 3: Have your child use the sponges (one per color so you don’t have to bother with washing them in between colors) to paint dots for the lights. Instruct them to be VERY careful as enamel paints are more difficult to wash off your skin than other paints. I held my 3 year old in my lap and held her mug for her while she painted. That way, I was able to closely monitor her contact with the paint. My 4 year old did a great job on her own. Step 4: Leave to dry. Remove the tape. Follow the instructions on your paints for drying and baking. Mine had to dry for 48 hours, then bake at a low temperature for half an hour. Wrap these up with a packet of hot chocolate, some mini marshmallows, chocolate chips, and a candy cane for a fantastic gift! Looking for more ideas for decorated ceramic mugs? Check out my “Hand-Decorated Mugs” Pinterest board! Do you have some other ideas for gifts that won’t get thrown away? I’d love to hear them! Jessica is a wife, mother, and most importantly, a follower of Christ. She enjoys spending time with family, crafting, and finding ways to teach her little ones at home. She also enjoys keeping up her own blog, Candle in the Night where she encourages moms of preschoolers to become the best moms they can be!